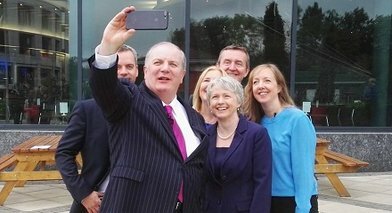 The Dublin Brexit Breakfast Roadshow MC Gavin Duffy takes a selfie with Enterprise Ireland's Anne Lanigan and the panel of speakers, including Michael Fitzgerald from Abtran, Andrea Cawley from Automatic Plastics, Justin Lawless from Intact Software and Siobhan Gannon from Irish Dog Foods. The Dublin event took place last week at the Helix Theatre. Sunday Independent: In an increasingly competitive business landscape, Irish companies that want to stay ahead of the curve need to look further afield for new opportunities. With a common language and diverse opportunities, the United States is a natural next step. Accenture Leaders of Tomorrow winners are sisters Ailbhe and Izzy Keane, co-founders of Izzy Wheels, which offers customised spoke guards for wheelchair users. Hundreds of companies have passed through the doors of Dublin’s Digital Hub since it was established in 2003, with household names such as Amazon and Etsy among them. Public engagement, whether in art, science or business, is always a matter of confidence and performance. Ireland is right on track to hit its Horizon 2020 funding target, with €424m now secured through the science initiative. Brexit is a certainty, though what exactly that will entail is not. But that’s no excuse for Irish businesses not to be prepared. The age old art and tradition of Irish matchmaking has moved into the digital age thanks to a new app from an innovative Dublin woman. For the world’s first company to develop software which can turn a commercial drone into a search and rescue platform, the sky is the limit in terms of opportunities.